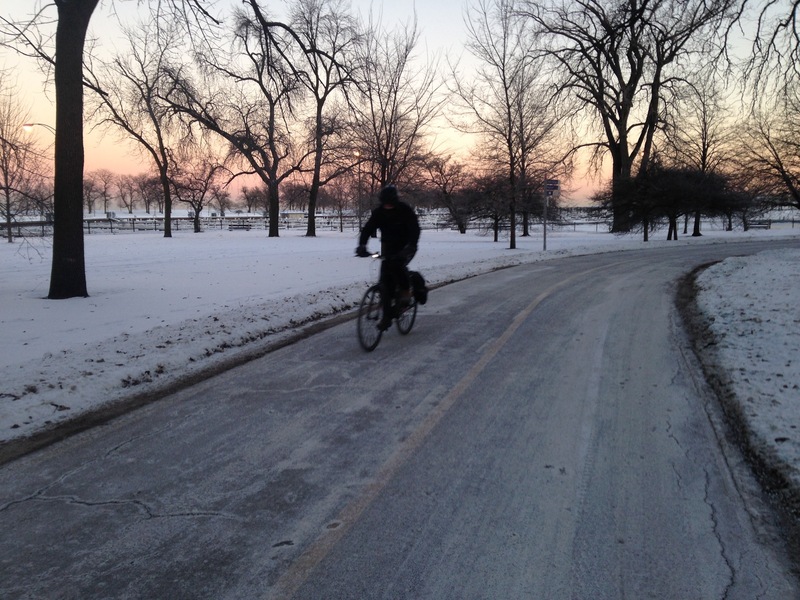 The Chicago Park District continues to do a bang-up job of clearing the Lakefront Trail. When I rode it on the North Side Monday afternoon in the wake of last weekend’s snowstorm – the second snowfall in as many weekends — the pavement was generally dry as a bone. Last I heard, the trail on the South Side was in pretty good shape as well. But while the lakefront has been plowed twice in a little over a week, the Bloomingdale Trail, aka The 606, hasn’t been plowed at all this month. 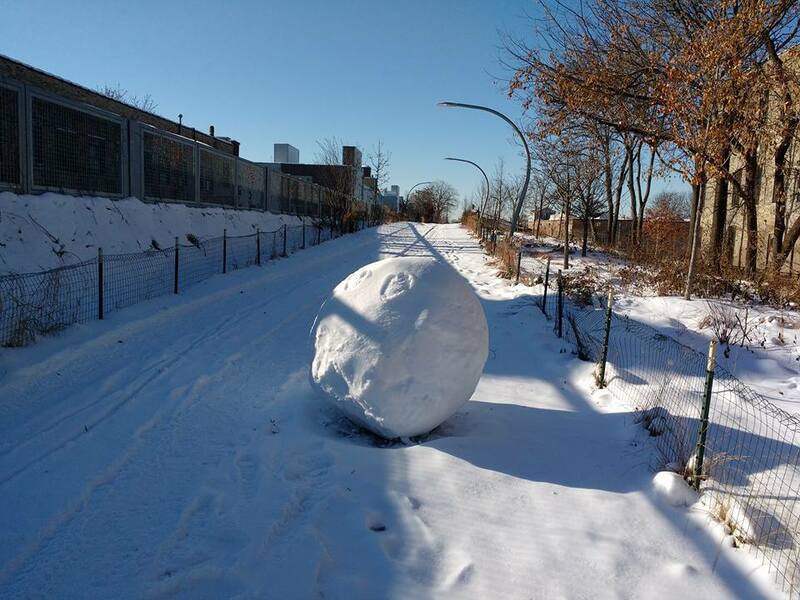 According to photos recently posted on the Friends of the Bloomingdale Trail Facebook page, the elevated path currently resembles some of the more scenic parts of Greenland. Until recently, the Bloomingdale’s official website stated that the trail would be plowed “in all but the heaviest snowfall.” After the first four-inch accumulation (certainly not a heavy snowfall by Chicago standards) of the year went unplowed, last week I asked the park district for an update on their maintenance plans via Twitter. “With more snow predicted this weekend we won’t be clearing the trail,” a spokesperson responded. Text was also added noting that, unlike the Lakefront Trail, only a brush can be used on The 606 in order to avoid damaging the path’s surface and vegetation. Still, it seems like the resourceful people at the parks department should be able to figure out a way to safely clear the Bloomingdale after heavier snowfalls, so that it can continue to play its important role as a safe bike-commuting route for individuals and families. I reached out to this person (device? vehicle?) via direct messages on Twitter to learn more about the Chicago city worker with the easiest job in town. John Greenfield: Judging from photos, you didn’t plow the trail last weekend. Did you instead take the advice the park district tweeted out and “use The 606 for winter sport activities, such as snowshoeing and cross-country skiing”? The 606 Snowplow: The “winter sport activities” advice is some “let them eat cake” nonsense. They are not grooming the trail for cross-country skiing, and any snowshoer will tell you the icy snowpack is not optimal for the sport. It’s a dangerous surface to run on as well. Running and bicycling are some of the only athletic activities you can actually do in a Chicago winter, and the park district’s advice is oblivious, bordering on insulting. John Greenfield: What do you make of the park district’s evolving policy towards snows clearance? The 606 Snowplow: It’s disappointing. If they don’t have budget to clear the trail, or if their machinery isn’t up to the task, they should be transparent about it. The trail was beautifully maintained last winter, and it was a usable commuting route. Even when there was a single [plowed] lane down the center, it was much better than sharing side streets with distracted drivers. I bet someone could crowdfund a private service to clear the trail if the city is unwilling or unable! But come on, let’s be honest about the task at hand. JG: People have been posting photos of the rutted, icy 606 on Facebook and arguing that the conditions are no good for anything but besides falling down. What’s your response to their complaints? The 606 Snowplow: I think a lot of people have got used to using the trail for utilitarian transportation. There are several schools along the route, and last year I saw kids walking up there all winter. A lot of people bike to work year ’round, or take a Divvy bike to the CTA or Metra stops along the trail. Let’s be real, most people are not up there playing during the week. They are trying to do their jobs — anything from delivering food, to commuting to the office, to transporting children to school or daycare. The conditions are not up to par for a working city. JG: How did you land such a dream job? The 606 Snowplow: Let’s just say I know a guy! JG: Anything else you’d like to tell all your fans (or haters)? 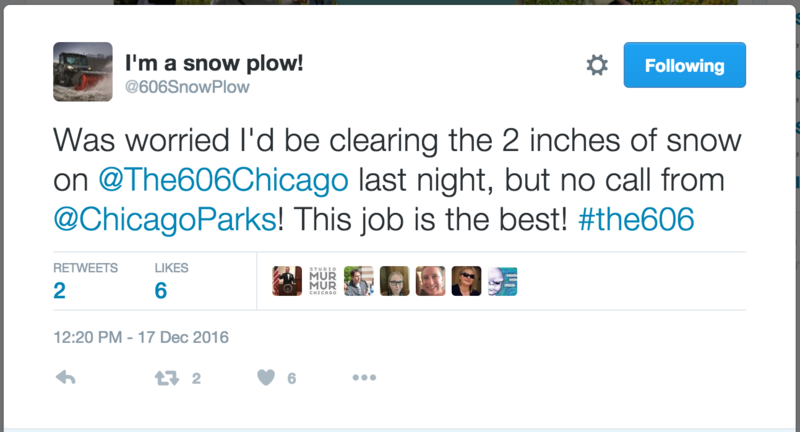 The 606 Snowplow: I want to make it explicitly clear that this is a joke account. I’m not an anthropomorphic snowplow, I don’t work for the city, and I have nothing but respect for the actual workers who clear Chicago park paths in sub-zero weather — their jobs are physically demanding and difficult, and they single-handedly make public space usable for Chicagoans. That said, The 606 has not been plowed at all this winter, and social media is often the best vehicle for raising awareness and getting s— done. I live next to a park and the Park District clearly owns mini plows that they use to clear the sidewalk in front of the park, not sure why they can’t use these. The snowplow account is not funny at all. I much preferred the likes of Logan Square Driver. Perhaps when one comes from a country where cycle tracks are plowed before the roads, it’s impossible to find humor in poor bikeway maintenance. Anybody want to go to the Walk With Light event with light up letters? We’ll need 8 people to spell “P-L-O-W T-H-I-S”, extra props if we get 13 people so we can add “T-R-A-I-L”. Um, I think you’d better get 13 people. The actual Twitter posts aren’t too bad, but the plow completely missed the concept of this “interview”, and forgot to speak in his duty-shirking plow-voice (even though John was trying to coax him back into it), and instead we just got the voice of a frustrated human trail user. If you’re gonna do satire you gotta go 100%! But hey, your comment got circled back onto his Twitter, so there’s that! JG: Outdoor work in sub-zero temperatures is challenging and potentially dangerous. What are you doing to stay safe? The 606 Snowplow: Anyone who labors in a northern climate knows there’s no bad weather, just bad gear. We layer on long underwear, insulated overalls, waterproof boots, leather, Gore-Tex, and do our job. When it gets really cold, or if you’re sitting down (like when driving an open cockpit vehicle) we wear battery-powered heated jackets and gloves. When you’re working hard, you sweat a lot and don’t feel the cold nearly as much. JG: You tweeted recently about a warm-weather vacation. Where did you take it? The 606 Snowplow: You’ve gotta have a backstory for an engaging character. I was thinking the beaches of Mexico would be a great get-away from a Chicago winter! I cross country skied the 606 yesterday. It was outstanding. I certainly hope it stays unplowed. Great way to take advantage of snowy weather. The packed down and firm snow was very good for skate style skiing. I bet this has more to do with the plantings. They kept it surprisingly clear all last winter, but then they did a whole lot more planting this year. I could see how salt and plants don’t mix, but it’s a pretty critical part of bike infrastructure to just leave to the wilds of chicago winter. The Bloomingdale Trail, aka The 606, was intended to be an oasis of calm in the hectic city. So it’s completely wrongheaded that the Chicago Police Department will soon be patrolling the path with all-terrain vehicles.